The Arctic is a less forgiving place than many folk care to recognize. Shell have just moved back the date on which they plan to restart drilling in the Chukchi Sea and won’t be going up there this year. At the same time, last August, Gazprom announced that the development of the Shtokman gas field off the Russian coast and also in the Arctic had been put on an indefinite delay. Yet the region still shows considerable promise. 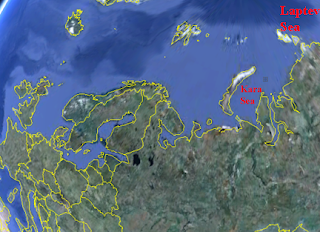 ExxonMobil and Rosneft have agreed to exploration in the Chukchi, Laptev and Kara Seas, with the latter considered as possibly having the highest potential. The blocks that will be explored are South of the island of Novaya Zemlya, in relatively shallow water. They lie north of the Yamal Peninsula, and the Shtokman field is on the other side of the island. Rosneft estimates that the reserves that are recoverable are 6.2 billion tons of oil, and a total of 20.9 billion tons of oil equivalent when the natural gas content is included. The first wildcat well is scheduled to be drilled in 2015. 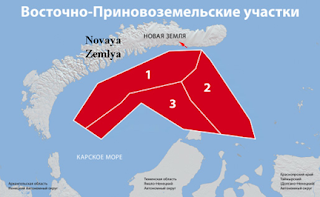 While Gazprom and Rosneft share access to these offshore resources, Lukoil has found a site at Khatanga Bay in the Laptev Sea where it believes that it can be successful. Despite the difficulties, the need for Russia to sustain production is forcing the companies offshore into more difficult waters, it is where the future production lies, and the Russian economy needs the income. The Vankor oil field is expected to average 435 tb/d in 2013, a minor increase from the level of 410 tb/d achieved by the end of 2012. Some operators provided that new technologies will be utilized to stop natural decline. On the other hand, the supply forecast remains associated with a high level of risk, due to technical, political, geological and price factors. On a quarterly basis, Russian oil supply is expected to average 10.43 mb/d, 10.42 mb/d, 10.42 mb/d and 10.42 mb/d, respectively. Preliminary figures indicate that Russian oil production stood at 10.46 mb/d in January, steady from the previous month. As usual it is interesting to compare the OPEC production results for the last few months, based both on the reports obtained from secondary sources, and those numbers that the individual nations provide. It is important to note that Saudi Arabia has dropped its production by around 300 kbd or so for the last couple of months. While I suspect that this to keep markets a little tighter and thus hold prices stable, others might suggest that the may have some slight difficulty sustaining the higher numbers. Iran continues to have a disparity of around 1 mbd between the two tables, Iraq still seems to be struggling to get over 3 mbd, and Venezuela has a discrepancy of around 400 kbd. In short, not much new. Turning back to look for just a moment at Gazprom activities, although they have continued to keep Lukoil out of the Arctic, they have also continued to seek resources abroad. The company has acquired territory in Iraqi Kurdistan and is reported to have an 80% stake in the Halabja project with reserves of around 700 mb. The field lies on the Iranian border in the Kurdish part of the country, and Baghdad objected to the deal going forward. It might, however, help raise Iraqi overall production. Gazprom has two other projects in the region at Garmian and Shakal, and one at Badra which falls under the control of the central government. And, still in the Middle East, Gazprom is in talks with Israel to buy LNG from the offshore Tamar field and ship it to Asia to serve markets that it cannot easily reach with its pipelines. The intent is to use a floating liquefaction plant that will take gas from both Tamar and Dalit, at the rate of around 3 million tons a year with production starting in 2017. Gazprom recognizes that, if it is to develop Asian customers it must provide LNG and so it has begun work on an LNG plant in Vladivostock with three trains, each capable of producing 5 million tons of LNG a year, from the Sakhalin, Yakutia and Irkutsk gas fields. With production aimed to begin in 2018, the market will, again, be in the Asia-Pacific region and may be one of the reasons to accelerate production from the Kovyktinskoye field. At the present time Gazprom has brought the Zapolyarnoye up to full production, and they estimate that this will produce 20% of Russian natural gas as the field moves to be the largest producer in the country. 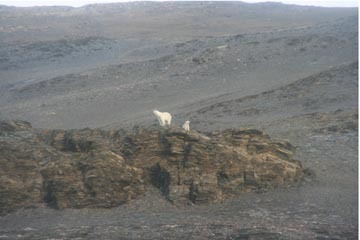 And, while tracking down some of the information for this post, I did find a picture of a polar bear and cub in the region that ExxonMobil is venturing into. It was taken on the island of Novaya Zemlya. Hopefully environmental concerns won't raise the same sort of difficulties in developing these sites that they have in other places further East. Oh, and before I forget the Alaska pipeline continues to run below 600 kbd with an average of 577, 604 bd. for January. eToro is the ultimate forex broker for beginning and full-time traders.